Enjoying a cup of Blue Mountain coffee are (l-r) Member of Parliament for East Rural St. Andrew, Juliet Holness; Minister of Tourism, Hon. Edmund Bartlett; and Minister of Industry, Commerce, Agriculture and Fisheries, Hon. Audley Shaw. The occasion was the press launch for the Second Annual Jamaica Blue Mountain Coffee Festival today (January 15) at the Jamaica Pegasus Hotel, New Kingston. This year’s festival will take place March 1-3 at Newcastle in St. Andrew. Jamaica Minister of Tourism, Hon. 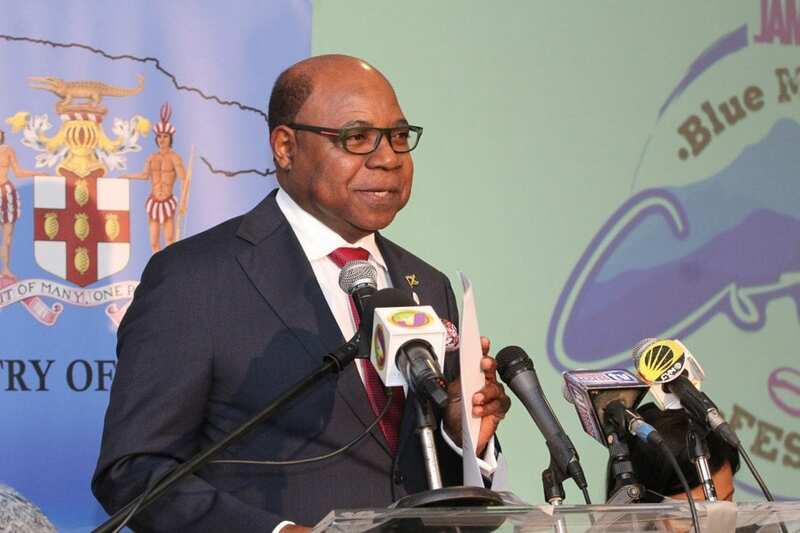 Edmund Bartlett says the Ministry’s Tourism Linkages Network intends to leverage public private partnerships to build out a framework to stimulate entrepreneurship in the coffee sector and related industries. “Coffee has the potential to become a commodity that can change communities through linkages with tourism. This is particularly important as our coffee farmers continue to experience challenges due to shrinking international markets and low prices,” the Tourism Minister said. He was giving the main address at the press launch for the second annual Jamaica Blue Mountain Coffee Festival today (January 15) at the Jamaica Pegasus Hotel, New Kingston. This year’s festival will take place March 1-3 at Newcastle in St. Andrew. Describing tourism and coffee as two of Jamaica’s most important economic industries, Minister Bartlett said the build out will be done through the Tourism Linkages’ five networks: Gastronomy; Health and Wellness; Shopping; Knowledge; and Sports and Entertainment. He advocated using 100% of the coffee berry to do so, instead of the 20% now used in coffee production. It will include the development of an entire cottage industry around the supply of spa products to a growing health and wellness sector as well as building out the retail market for coffee by-products. “The coffee festival is one such offering. 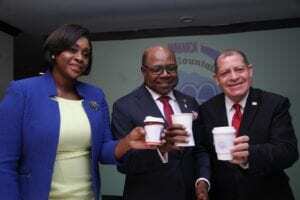 Yet, while Jamaican Blue Mountain Coffee is our value proposition, we must work together to build a sustainable coffee sector with a multiplier effect that creates more jobs, businesses and revenue for rural communities and beyond,” Minister Bartlett told the large gathering of tourism and coffee stakeholders. Tourism Minister, Hon. Edmund Bartlett discusses using the Ministry’s Tourism Linkages Network to build a sustainable coffee sector that creates more jobs, businesses and revenue for rural communities. He was giving the main address at the press launch for the Second Annual Jamaica Blue Mountain Coffee Festival today (January 15) at the Jamaica Pegasus Hotel, New Kingston. This year’s festival will take place March 1-3 at Newcastle in St. Andrew. Meanwhile, Member of Parliament for East Rural St. Andrew, the Most Hon. Juliet Holness, promised her unwavering support to the festival, which is providing additional income and building entrepreneurship in the Blue Mountain Coffee communities. Acting Director General of the Jamaica Agricultural Commodities Authority (JACRA), Gusland McCook, lauded the festival for providing another avenue to create awareness around Jamaican coffee in general and Blue Mountain coffee in particular, which will help to attract not only consumers but also investors. Last year’s inaugural Jamaica Blue Mountain Coffee Festival saw some 1000 patrons, 37 booth holders and 64 farmers participating in a three-day event. The Festival, which showcases Jamaica’s rich tradition of coffee production in the Blue Mountain region, is an initiative of the Tourism Linkages Network, a division of the Tourism Enhancement Fund. It features Blue Mountain coffee and coffee related products, food stalls, entertainment, cultural presentations, tastings and demonstrations, and workshops. A key component of the festival is the Farmers Trade Day, which includes presentations and networking opportunities with industry stakeholders. The festival also pairs with the Jamaica Blue Mountain Culinary Trail, which this year features 14 stops at bars, restaurants and attractions, including Belcour Lodge, Café Blue, Crystal Edge Restaurant, Strawberry Hill, Blue Ridge, Holywell National Park, Old Tavern Coffee Estate, Mavis Bank Coffee Factory, among others in the Blue Mountains. KANGAR, Malaysia - Tourism Malaysia has expressed optimism of an increase in the number of foreign tourists visiting Malaysia following a drop in the value of the ringgit against major currencies. The Hawaii Tourism Authority (HTA) is actively seeking applicants to be considered for 3 key executive positions. Italian singer of Seychellois descent, Farried Dufrene, is keen to promote Seychelles in Italy.